We hate to see you go but we also hope you enjoyed your time with us! ​Your login is the email address used to purchase your membership. If you have forgotten your password, please use the 'Forgot Password?' link. If your login does not work, please ensure you are logging in to the same location you purchased through! You can change the location in the top left corner underneath the InnerActive logo. ​Once logged in you will be able cancel your membership by clicking on the cancel membership icon. This is located near the top right of the page where your active membership details are shown. 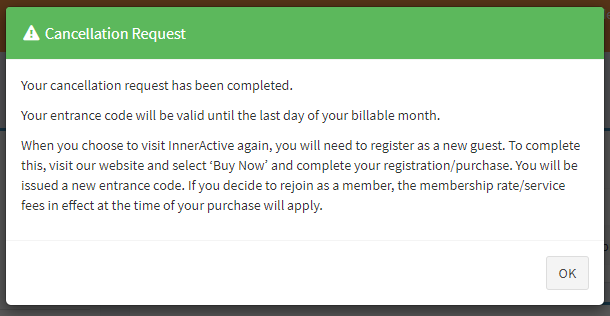 After clicking on the cancel membership icon a cancellation request confirmation will pop up. Please confirm YES you would like to cancel your membership. ​This pop up will confirm what date your membership and entrance code will be active through. Once you submit the cancellation you will see the message below. A confirmation will also be emailed to you. *We are not able to pro-rate a cancellation requested for a partial month, and dates in the past will not be accepted or refunded. Thank you!